Since their inception, above-ground models have been a popular alternative when it comes to residential swimming pools. Why? For starters, they've always been less expensive than in-ground pools, a point that is not lost on homeowners. Other selling points: above-ground pools are a breeze to install compared to building in-ground pools, most can be disassembled at the end of swim season, and that portability makes them good choices for renters or those who would like to take their pool with them when they move. Early above-grounders were made by Doughboy Recreational and Haugh's Products, which produced inflatable "splasher" kiddie pools, then branched out into larger styles in various shapes that were manufactured with materials like aluminum, steel, and synthetic fabric liners. By the 1960s, the pools became bigger, deeper, and had similar equipment to in-ground models, including circulation and filter systems. In later decades, safety became an issue, like jumping and diving into relatively shallow water or worse--drowning. Manufacturers worked with the Consumer Product Safety Commission (CPSC) to educate buyers on safe practices and signage on or near the pool. In recent years, above-ground pools have drastically changed in appearance and features. Some are equipped with fiberoptic and LED lighting, upgraded circulation systems, and spa-like extras. An above-ground can be sunken into a deck surround, into the ground, or be referred to as an on-ground pool. Like anything, owners can choose pools that are basic stock tanks or elaborate models big enough to entertain friends and family. Take a look at a variety of above-ground pools, from the mid-20th century through contemporary, the latter of which do great impersonations of in-ground models. A vintage black-and-white photo from Doughboy shows the life of leisure that surely awaited the average consumer once they bought a round above-ground pool, complete with pool deck (or perch) and the suburban dream. Those acres of green lawn were certainly ample enough to accommodate the largest round Doughboy pool in 1950s Anytown, U.S.A. With sides made of aluminum or steel, the pools were sturdy enough to hold gallons of water, not to mention your family, cousins, the neighborhood—heck, the whole community! Stock tank pools are no-frills alternatives to standard above-ground and in-ground models. While most are above ground, some owners build a deck surround for easy access. San Antonio Above-Ground Pool Co. The Above Ground Pool & Spa Company in San Antonio, Texas, has won awards for its innovative above-ground pool designs. Here, in a hilly section of San Antonio, an above-ground pool is connected to the house above it via a custom-built wooden deck. The deck is also comfortable on swimmers' feet and provides an anti-slip surface when things get wet as swimmers enter and exit the pool. The surface surrounding a pool is always an important consideration when choosing paving materials or decking. When above-ground swimming pools became popular in the 1950s-1960s, the most popular and common shape available was the classic round. It still remains popular, but has been updated with decking, fencing, stairs and a safety gate. Doughboy, the manufacturer of this pool, recently started making in-ground swimming pools in addition to above-grounds. Technically, Doughboy in-grounds are actually above-ground pools that can be sunk into the ground up to a depth of 7 feet. It's all part of what the company calls its "Doughboy Buried Pool Program." 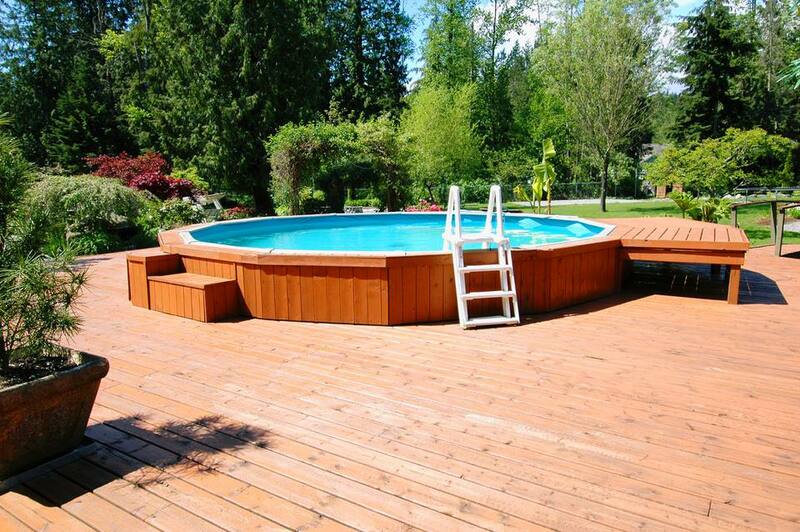 If you have do-it-yourself skills, try making a frame or wood surround for a rectangular-shaped above-ground pool. That's what Manolo Andre did with this Bestway model. Of course, it would be more of a challenge to make a frame for a pool with a curvilinear shape. Always looking for another DIY project, design blogger Carol Beckman and her family built a raised deck surround for their above-ground pool, enclosing it with fencing and an arbor-covered gate. During swim season, the area is decorated with string lights, fun floats, and container plants. The family's fluffy Great Pyrenees dogs enjoying posing near Carol's projects and are eye-catching models. How do you incorporate a flagstone patio with a new above-ground swimming pool? While beautiful and durable, walking on flagstone pavers in bare feet isn't exactly a softy and cushiony experience. The deck builders came up with a smart solution that eases the transition from flagstone patio to pool: a multilevel deck that creates a surround for the pool, giving it the appearance of an in-ground model. Wood decking is much kinder on swimmers' bare feet and is more anti-slip than flagstone. The deck levels also serve as low, wide steps leading up to the pool deck, and can be used as casual seating or a place to dry off after swimming. This pool is separate from the house, off in a corner of the property, making it more of a private swimming and sunning retreat. A fence and gate make it a safe haven that would be difficult for young children to access. That's no substitute for employing layers of safety for a residential swimming pool. Here's another example of an above-ground that doesn't look like an above-ground, with wood decking flush with the level of the top of the pool. The effect is like a sunken bathtub or the look of an in-ground, custom-built swimming pool. From this vantage point, it's really hard to tell that the oval-shaped swimming pool is an above-ground pool. At least, it started out as an above-ground pool. Sunken into a raised deck surround, the pool has all of the conveniences and accessibility associated with a more permanent design. With the outdoor patio dining set, umbrella, and trees, the entire pool deck has a look of permanency. The main differences between an in-ground and above-ground in this setting: cost and materials. Creating an enclosure for an above-ground pool makes it a walled, fenced, and gated backyard destination. Built on a platform with a surrounding deck, the pool area becomes a private paradise, especially if it includes container gardens, outdoor accessories and amenities, lounge chairs and other furniture. Making sure there is space for swimming needs (extra towels, cold beverages) allows swimmers and sunbathers to hang out at this backyard pool area for several hours, rather than having to go back and forth to the house to get supplies, food, etc. High walls and a raised platform also give the pool owners privacy, which is something that most residential pool owners desire. This oval sunken-in above-ground pool and large deck surround have a look of permanence. An above-ground swimming pool is surrounded by a beautiful wood deck. The addition of a retractable—or mechanical—pool cover makes it easier to keep the water warm and clean. Retractable pool covers are available in automatic and semi-automatic styles, both of which may be operated with a remote control. They are usually made of water-resistant materials like mesh, nylon and various forms of plastic, corrugated fiberglass and foam.